I'm back today with another challenge card. 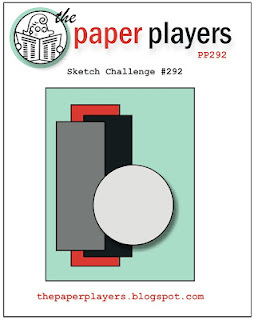 This time, it's for the Pals Paper Arts sketch challenge. And here's the banner that inspired it. I knew that the next few days are going to be super busy so I wanted something extremely simple. I found it in the Project Life "Let's Get Away Card Collection and Accessory Kit. I just pulled two cards from the kit, trimmed them a bit so they would fit better, and adhered them to my Bermuda Bay Base. 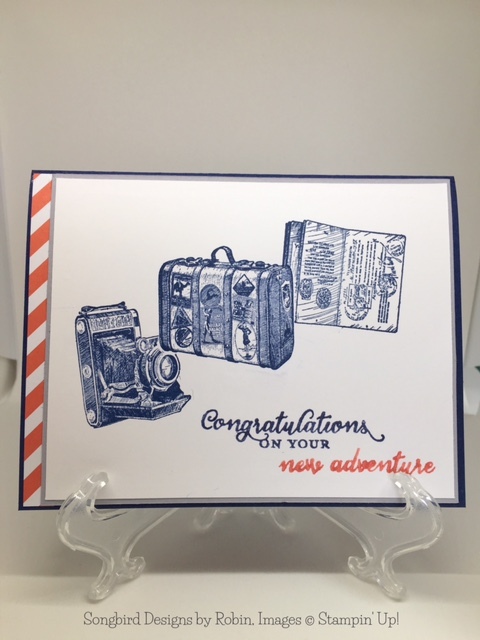 Next, I took my Project Life "Let's Get Away" stamp set and stamped the sentiment in Bermuda Bay and the cute little car in Melon Mambo. 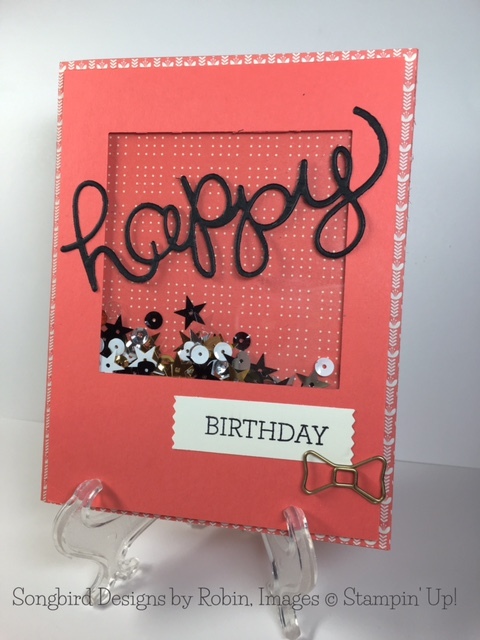 To finish up my card I took 3 dots from the Accessory Kit and added them to the sentiment card for a little bling. I then wrapped some Bermuda Bay Baker's Twine around the top and tied a bow. My card is as cute as can be and was completed in ten minutes! I'm using the rest of my Project Life items to complete a memory book about our family's trip to Maine last summer. I'm looking forward to reliving those fun memories! If you like these Project Life items, you better order them quickly. They are on the Retired List. Today I'm saying farewell to Summer Silhouettes. I have certainly gotten my money's worth from this versatile set. If I wasn't using the flower, I was working the leaves into a collage. Now I'm going to use it for two weekly challenges-Paper Players #292 and Can You Case It #117. My card uses 2 strips of paper from the SAB Paper Pack, Wildflower Fields. I colored in some of the dots with my marker in Calypso Coral since I don't have peach ink or paper. The diagonal striped piece of paper comes from the Pastels Designer Series Paper Pack. I adhered the strips to my cardstock according to the sketch. 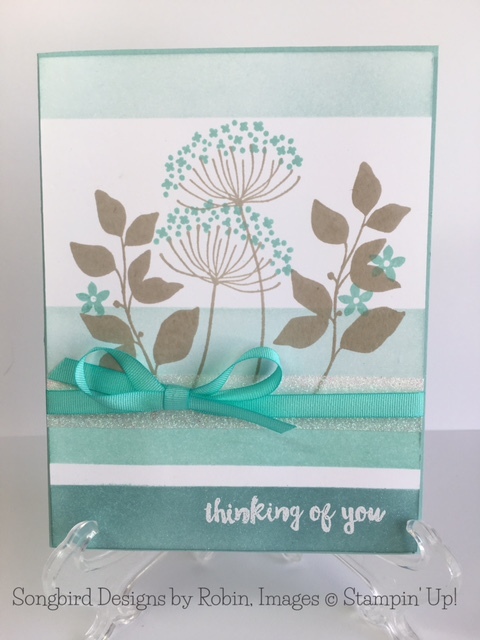 I stamped the flower and stem from Summer Silhouettes and added the sentiment from Teeny Tiny Wishes. I punched it out with a circle punch, mounted it on Calypso Coral and added it to the card to complete the sketch. I added 3 rhinestones colored with a black Sharpie to add a little bling. I loved the way this card turned out! I hope you do too! I love to get comments. Please leave one below. I like the FMS sketch because it is pretty wide open. That makes it easy to work with. The GDP colors are fabulous! 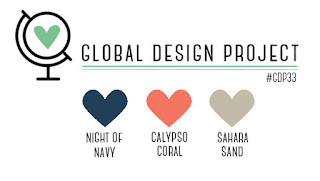 I would never have thought about adding Calypso Coral to the other two. Today I'm working with the Traveler stamp set and the Wild About Flowers stamp set. Don't see any flowers on the card? That's because I'm only using the sentiment. I think it fits perfectly with the images from Traveler. The only Designer Series Paper (DSP) on this card is from the Designer Series Paper Stacks. I love the perky stripe! I stamped the suitcase image from Traveler first and then masked it. On either side, I then stamped the camera and passport images. I am in LOVE with this set! The images are perfect for guy cards. 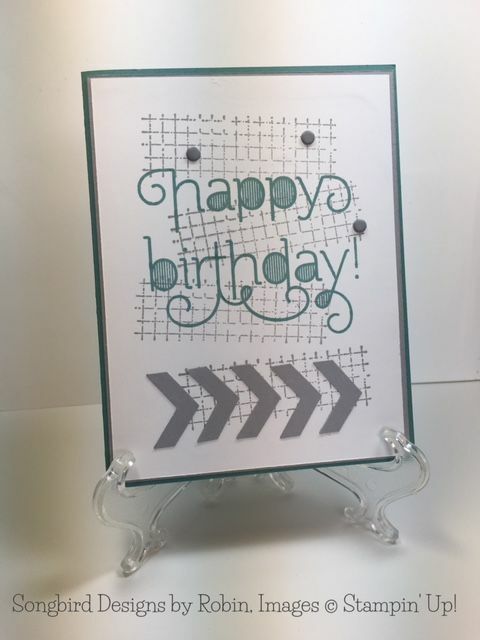 I used Stampin' Write markers to color the sentiment. I added it to the lower right-hand side to comply with the sketch. 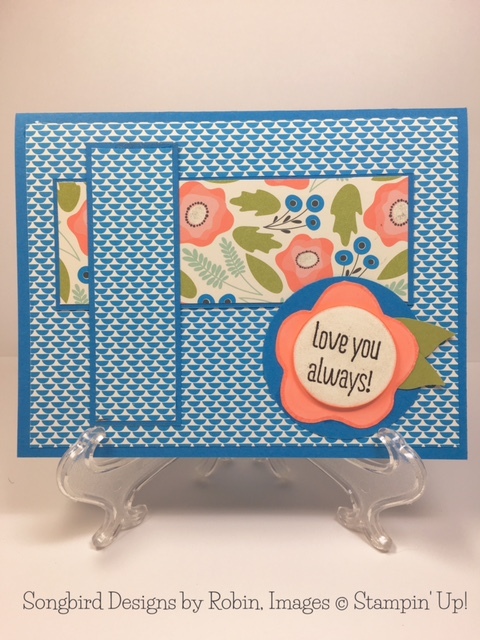 I mounted my stamping on a Sahara Sand piece of cardstock and then finally added the finished product onto my card base. I am so happy with the way this card turned out! Let me know what you think in the comments below! I love all the stamps in this set. They are simply adorable. For this card, I started out with a Crumb Cake card base which I stamped with the garden glove stamp. I stamped off once before stamping my card. The pots are Tempting Turquoise and the plants are Cucumber Green, Daffodil Delight, and Watermelon Wonder. I colored them with my Stampin' Write Markers. The sentiment is from the set. I colored it in Crumb Cake except for the word "Spice" which I colored in Watermelon Wonder. I finished up my card with some Watermelon Wonder Dotted Lace Trim and a piece of Venetian Crochet Trim. Both of the lace trims are on the Retiring List. Better order them before they are g-o-n-e! Before I get to today's card, I'd like to thank Joanne over at The Paper Players for choosing my card as a pick last week. Here's the card that won her over. My card uses a Blushing Bride card base. The panel down the middle is So Saffron. The banner is punched on either end using the Triple Banner Punch. I placed a half inch strip from the Designer Series Paper stack horizontally on top of the banner. I placed a small gold doily on top of the paper strip. My butterfly is made of 2 parts. The bottom is a piece of Designer Series Paper (DSP) from the English Garden pack. 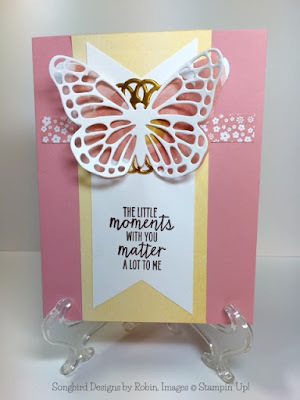 I die cut it using the Bold Butterfly Framelets. The top part of the butterfly is cut from the Butterflies Thinlets Dies and then sprayed with a clear acrylic spray to give it shine. The sentiment is from the Watercolor Wings stamp set. I love this sentiment! Now that my mom is gone, it's the little things we shared together that I cherish as memories. I hope you like my card today! Please leave a comment below and subscribe if you like what you see. Usually my posts are about challenges that I have entered. This one is not. 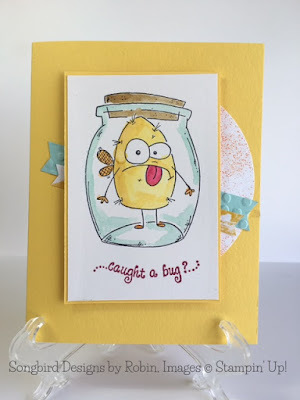 Today I am going to show you one of the cards I'm featuring in my Mother's Day and Father's Day card class. This one is for the dads. I CASEd it from Mary Brown. As you can see it's very clean and simple. A piece of Chocolate Chip cardstock is my card base. I added a panel of Crumb Cake with a 1/8 inch of Whisper White hanging below it. The Arrows are made from the Chevron Border Punch which is retiring June 1. 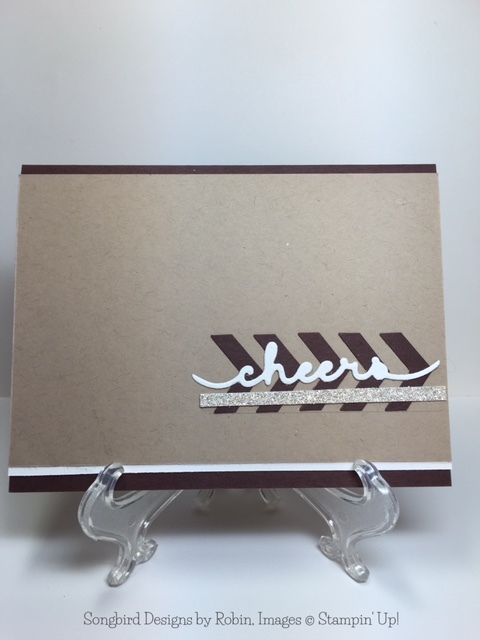 The "Cheers" is cut using the Greetings Thinlets which also are retiring. A 1/4 inch strip of Silver Glimmer Paper Finishes it off. That's all it takes to make a card for a favorite dad in your life! One of my daughter's childhood friends is getting married. Ann has been in Emily's life for over fifteen years. What's really fun is that my husband, who is a pastor, will be marrying the couple. This will be the third childhood friend that Steve will have married. Ann's shower is next weekend so of course I made a homemade card to include with her gift. 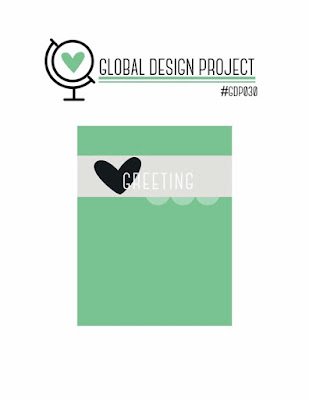 I am able to use Ann's card in the week's Global Design Project Challenge. This challenge is a CASE the designer one. 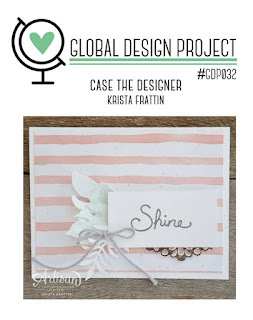 Here's Kristen Frattin's card that I CASEd. Kristin's soft and elegant card was perfect for my wedding card. Instead of using Designer Series Paper (DSP) for the background, I chose to mask and sponge the stripes in Perfect Plum. I used the For The New Two stamp set for my sentiment. I adore this pretty stamp set! You can snag it right now off the retiring list! I stamped the sentiment in VersaMark and then embossed it in silver. I die cut the embossed sentiment with a Lots of Labels framelet. I kept the peek-a-boo doily underneath my sentiment. I also kept the leaves but substituted die cut ones from the Rose Garden Framelets. My finishing touch was to substitute silver thread behind the sentiment instead of the bow in the front of Kristin's sample. I love the way my card turned out! What do you think? Please leave me a comment below and subscribe to my blog if you like what you see. Interested in the updated retirement list? Here's the link to take you to it. This is my second post today. I've been a busy girl. 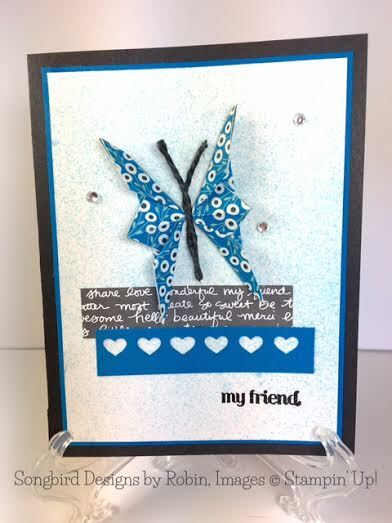 I'm in a Facebook Chat with other talented stampers. The Admin of the group has been very sick and I made this card to cheer her up. Here is the banner from Fab Friday that was my inspiration. As you can see, I turned the sketch on its side for my card. Instead of a doily, I used a semicircle splattered with Pumpkin Pie ink. Instead of the banners being straight, I set them askew because sick people are not upright and perky either. I've had the bug stamp forever. I don't know the name of it any longer, but it's made by Whipper Snapper Designs. The sentiment is an oldie but a goodie too. Hope you enjoyed this second post today. I love comments so please leave one below! Demonstrators can now look at the new Annual Catalog online. The lucky ones that were at Onstage actually have them in their hands! (So jealous!) Brian King challenged his team, InKing Royalty, to CASE one of the cards out of the Catalog. When you see the catalog, you'll realize that the layout is exactly the same and I used the same stamps. What's different? The colors, ribbon and the stamp pads. The card in the catalog uses some of the new In-Colors. I am already in love with these yummy colors! I guarantee you will be too! The other item I'm in love with is the new ruched ribbon that comes in the In-Colors. It looks like it's going to be very easy to work with. I can't wait to get my hands on it! The last wonderful thing I want to tell you about today is the new Ombre Stamp Pads. In the picture I'm CASEing, the cakes are stamped with them. So fun! I hope you like my catalog CASE and I guarantee you will ADORE the real deal on Page 22 when you get the new fabulous catalog in your own hands! I love spending the day with this kit! This isn't quite all-inclusive. You need to purchase the accompanying Tin Of Cards stamp set. This set is wonderful too. I've used to lots of times for other projects. You also need to provide adhesive, Dimensionals and ink. Here is a link to today's Retiring List. A new list will post daily as bargains disappear. This is a short post today because it's newsletter day. There is a tutorial for today's card in the newsletter. You can subscribe at the bottom of this post to get the tutorial for free. This card uses the Bleach Stamping Technique. I love the way it turned out! The Lost Lagoon cardstock actually turned into Wisteria Wonder when bleached! I'm going to try this with different colors to see what happens. Welcome to InKing Royalty's April Blog Hop! Stampin' Up! announced it's retired list yesterday - while we are sad to see some of our favorite products leave the catalog, we are certain that some amazing new products are on their way. As we introduce the 2016-2018 In Colors to you, we know we have to say goodbye to the 2014-2016 In Colors. 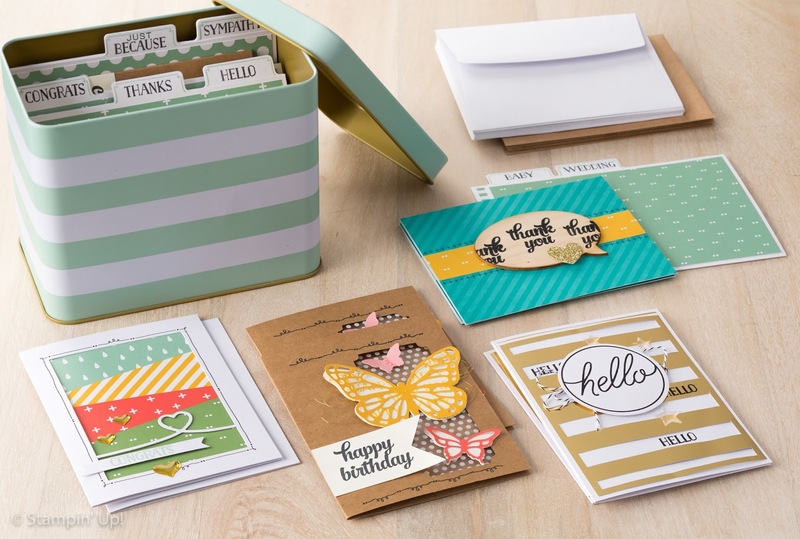 Today's Blog Hop is filled with inspiring projects that share some great ideas - featuring Hello Honey, Lost Lagoon, Tangelo Twist, Blackberry Bliss and Mossy Meadow. After you read my post, I hope you'll hop over to the next person on the list at the base of this post. This type of card is called a Split Card. 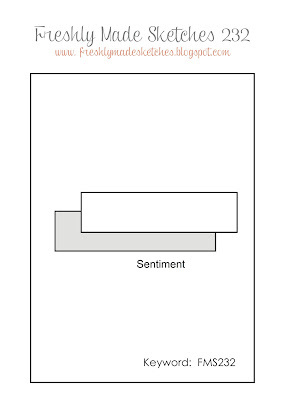 The top part of the panel and the bottom panel are held together by the piece in the middle. It sounds difficult but is very easy to do. 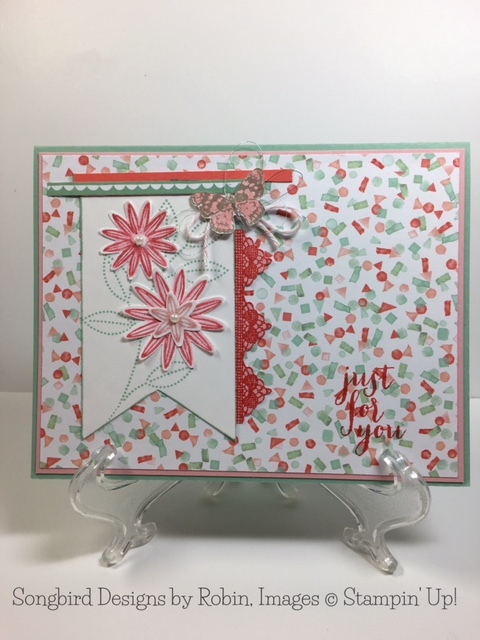 I used Lost Lagoon for my card base and adhered a Lost Lagoon Designer Series Paper (DSP) from the English Garden Designer Series Paper Pack. 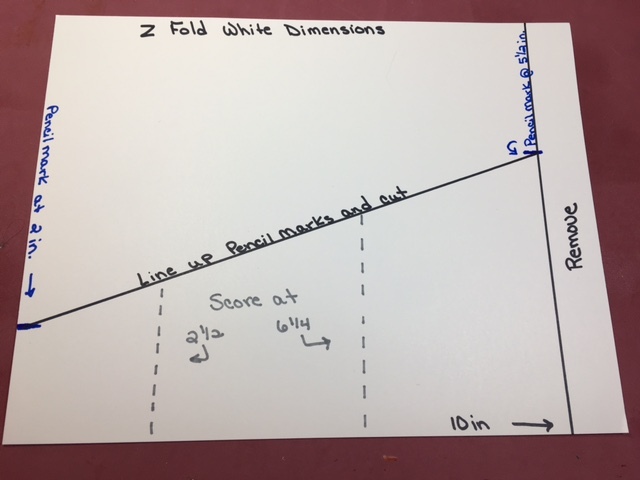 I cut a Whisper White piece of cardstock with the 3rd largest die from the Lots of Label Framelets Dies. Next I gave it a Lost Lagoon watercolor wash. Then I stamped the sentiment from the Wetlands stamp set in Tangelo Twist. 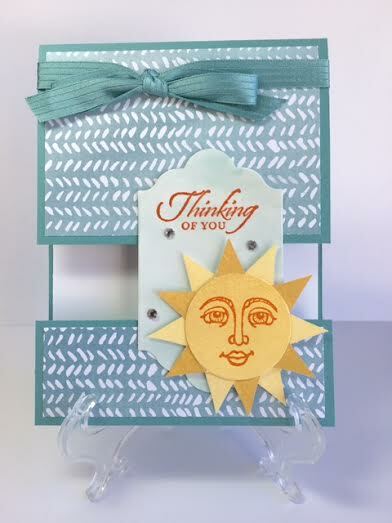 The wonderful sun is from the Ray of Sunshine stamp set. I think this set is kind of a sleeper. I don't think it gets the attention it deserves. I just love the face! For some reason, it really speaks to me. To make the sun, I stamped the circle in So Saffron and used a Circle Framelet to cut it out. I stamped the face in Tangelo Twist and embossed it with clear embossing powder. I stamped and cut out 6 saffron sun rays and then repeated the process with Hello Honey. I arranged the rays around the sun's face and glued them from behind. I added it to the center piece with Dimensionals. A few rhinestones finished the piece. I adhered the center piece to the top and bottom panels using Fast Fuze. Finally, I added a Whisper White piece of cardstock to the inside of my card so it is ready for a sentiment. Thank you for stopping by today. 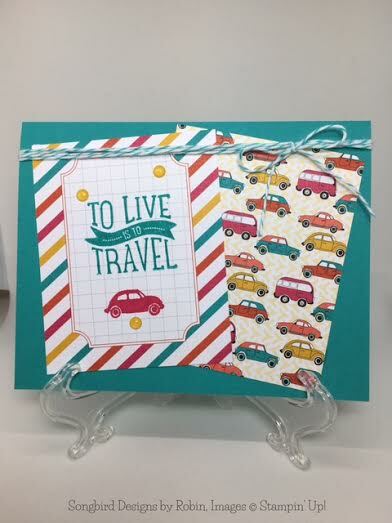 I hope you'll hop along to the next stop on the blog hop,Candy Ford at Stamp Candy. There's lots of inspiration to be found in this group - and you don't want to miss it! This is my second post of the evening. If you missed the first one, you can click here. 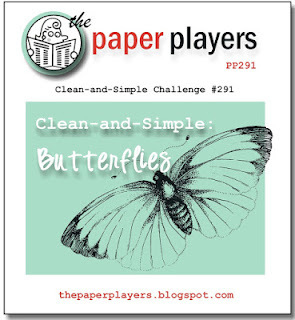 I was working on my newsletter and realized that I almost missed the PPA challenge! I stopped what I was doing and hopped to it! My card is built mostly on Designer Series Paper (DSP) and very little stamping. Why? These pretty papers will be retiring soon and I must use them up. I always save my paper because it's so pretty. I hate to cut into it. Silly, I know! 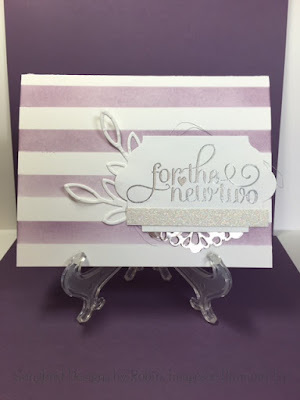 All of the DSP for this card came from the Pretty Petals Paper Stack. I like this paper because it is so perky. It's a really good deal too! My card base is made from Pacific Point cardstock and the DSPs are layered with Pacific Point as well. The flower stamp is from a past Paper Pumpkin. I selected it because it had a similar shape as the flowers in the DSP. I colored it with Calypso Coral and cut it out. The two Old Olive leaves are actually the wings from the bird punch. 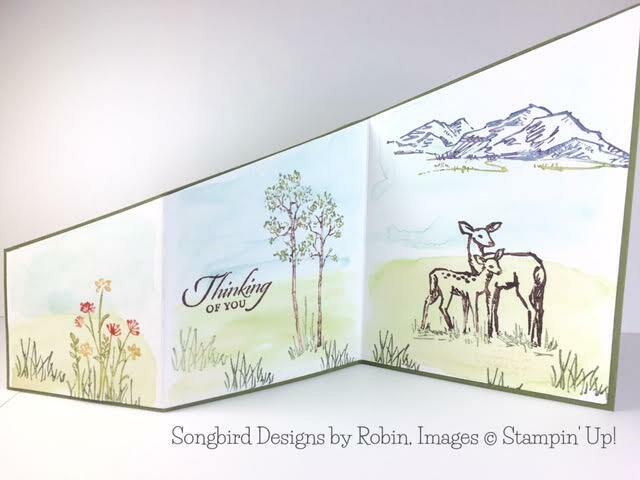 The sentiment is from the Something to Say stamp set. I punched the sentiment out and popped it up with a Dimensional. I adhered the finished flower on the circle to match the sketch. I like to have a little sparkle on my cards somewhere. For this card, I used the clear Wink of Stella to color the center of the DSP flowers and the sentiment. It's hard to see in the picture, but it's there. Hope you enjoyed my card. Please leave a comment below. I get lonely when nobody speaks to me! If you place a $150 dollar or more order, you will earn host rewards (free goodies)! Now would be a great time to order the Starter Kit! You can stretch your dollars even more! For $99 you get $125 of free merchandise of your choosing. You just can't beat that deal! AND you get a 20% discount for 4 months! If you are interested, email me at rmyren.songbirddesigns1@gmail.com and I'll tell you more about it! Age Awareness is one of the retiring stamp sets. Here's a card I have made using this set. The Bravo stamp set and the Candy Dots are also retiring. 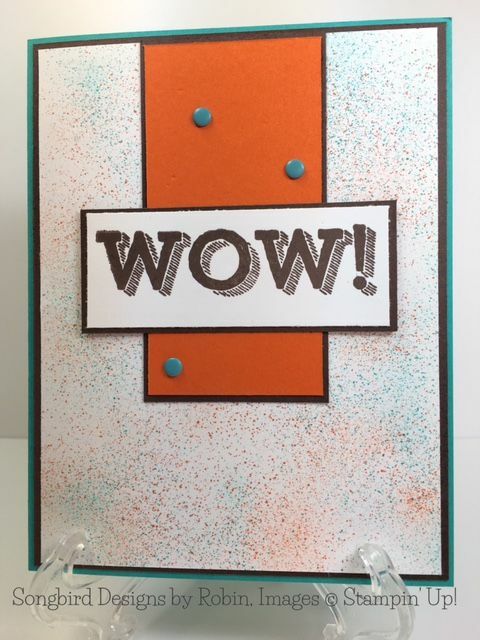 Here's a card I recently featured that uses a stamp from the set and the Dots. 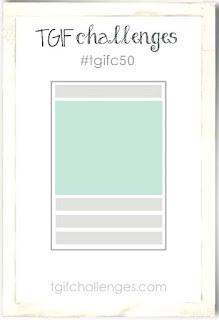 Tomorrow the inKing Royalty group, of which I am a member, will be featuring the retiring colors in our monthly blog hop. Come back tomorrow and hop with us! Didn't Kelly design a beautiful card? The first thing we did was mist our cardstock with Mint Macaron. It's hard to see here, but it softens the white. Then we stamped the background with a stamp from the You Got This stamp set. It is stamped in Sahara Sand. 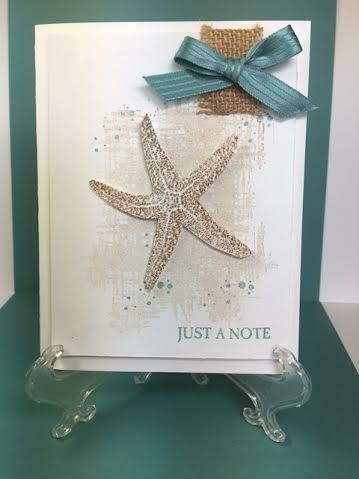 The Starfish is from the Picture Perfect stamp set. It is a 2 step stamp. The first stamp we inked in Crumb Cake, and the second stamp was inked with Soft Suede. The splotches are from the Gorgeous Grunge stamp set. I swear that stamp set shows up everywhere and for good reason! It's the perfect touch of color in Lost Lagoon. The blue is continued in the sentiment which is also from the Picture Perfect set. Kelly had us mount our artwork on a piece of Thick Whisper White Cardstock. I grew up on a small farm in Iowa. I have left the farm but the farm hasn't left me. I have a deep love and respect for nature. 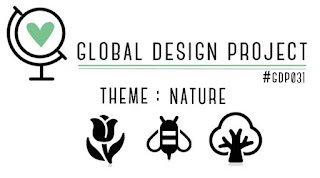 That's why I got excited when I saw the theme over at the Global Design Project Challenge! The theme this week is Nature, and I'm all over it. I love the serene scene this card created. I was actually serene while creating it too! My base is Mossy Meadow. The panel is Shimmery White cardstock. I started by watercolor washing the lower half of the panel in Pear Pizzazz and the top half in Soft Sky and let it dry. I colored directly on the stamps for the rest of this project. On the first panel, I used Always Artichoke on the grasses. I used Pear Pizzazz for the flower stems, and Calypso Coral and So Saffron for the flowers. On the second panel, I repeated the same color for the grasses but stamped off for some of the clumps. The tree trunks are Chocolate Chip. I used the Thumping Technique with Always Artichoke and Pear Pizzazz for the leaves. On the third panel, I repeated the grass clumps. The deer are stamped with Chocolate Chip and Always Artichoke. The Mountain is colored with Night of Navy, Elegant Eggplant and a bit of Pear Pizzazz. The sentiment is from the Wetlands stamp set and is stamped in Chocolate Chip. The Mossy Meadow card base directions are almost the same. Instead of removing the end at 10 inches, cut at 10 1/8 inches. Instead of making your pencil mark at 5 1/2 inches, make it at 5 5/8 inches. The rest does not change. 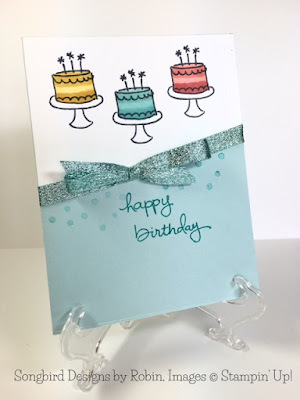 I hope you liked my card and tutorial today! Please let me know what you think in the comments below. If you like what you see, please subscribe to get my blog through your email. I built my card around the sketch and the butterfly. The butterfly is crafted from a piece of designer series paper (dsp) from the Pretty Petals DSP Stack. This bright blue paper worked beautifully for my butterfly. For the background, I spritzed Mint Macaron and Pacific Point ink on Whisper White cardstock. Sorry, it's a little hard to see in this picture. To the background, I added a strip of black text from the Neutrals DSP Stack. 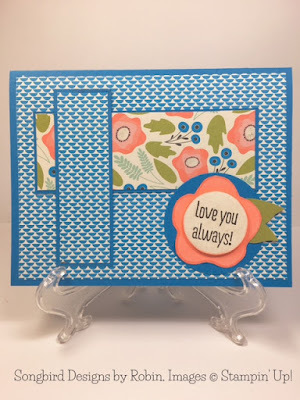 Next, I used the Hearts Border Punch to make a pretty strip from Pacific Point cardstock. Finally, I mounted the piece on Pacific Point cardstock and then put that on my Basic Black card base. I think my butterfly looks like it could flutter right off the page! What do you think? Let me know in the comments below. I love reading them! I want to take a minute to show you the tutorial in my newsletter today. My newsletter comes out every Wednesday morning. It contains Stampin' Up! 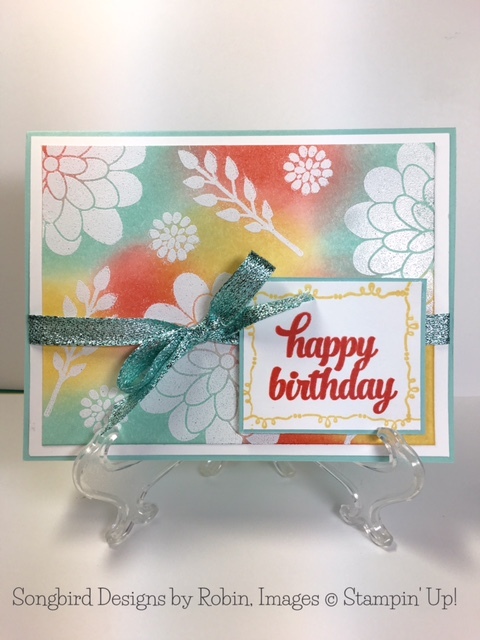 news, card ideas and a card fold or technique tutorial. Don't miss out on this free resource! Sign up at the bottom of this blog post so you receive next week's newsletter in your email inbox! The same old witchcraft when your eyes meet mine"
My card only uses the three colors above plus a little white thrown in for contrast. The black magic technique is very easy to do. 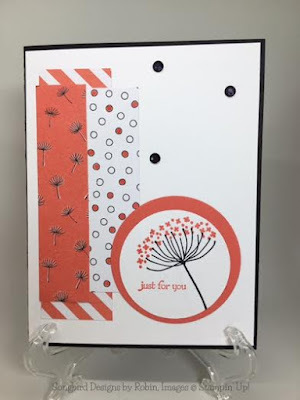 You stamp your images onto black cardstock using Whisper White CRAFT ink. Set it aside to dry or use a heat tool if you are impatient like me. Next, you color over the white ink with colored pencils. To complete the technique you highlight parts of the card with a white gel pen. That's it! The sentiment from the Wetlands stamp set is stamped in Cherry Cobbler. I die cut the sentiment and the Cherry Cobbler piece of cardstock behind it with the Tags and Labels Framelets and adhered it to my card with Fast Fuze. I finished my card with a white ribbon bow and one of the Botanical Garden Jewels Embellishments. Wave your magic wand and give this technique a try! Like what you found here today? Please leave me a comment below and subscribe to this blog! Stampin' Up! has so many gorgeous stamp sets. One of my favorites out of the Occasion Catalog is Grateful Bunch. The flowers are so perky and I adore the lace stamp! This stamp set even has its own punch, the Flower Bunch Punch. I grabbed this set and punch to do the Paper Craft Crew Challenges #189. The challenge this week is a sketch challenge. I like this sketch because there are lots of pieces to it. It made it easy to add color and texture to my card. My card is mounted on a Mint Macaron card base. On top of the base is a layer of Blushing Bride cardstock and a piece of Designer Series Paper from the Birthday Bouquet paper pack. I pulled my colors from the DSP- Mint Macaron, Watermelon Wonder and Blushing Bride. The flowers and butterfly have a coating of Wink of Stella for a little sparkle. The butterfly is mounted on a Blushing Bride Bakers Twine bow with some Silver Metallic Thread to finish it off. I hope you like this card as much as I do! I have the perfect person in mind to mail it off to. If you enjoyed your visit to my blog, please leave a comment below and subscribe to my blog. I'd love to chat with you on a regular basis! Sorry, my picture is so dark. It was a very dreary day in PA. today. This was the best I could do. Here is the banner for the PPA Challenge. Michelle Quinno chose a fantastically fresh color palette. Here is the inspiration for the Fusion Challenge. 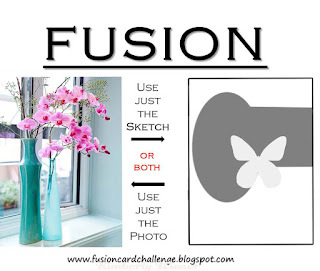 With this challenge, you may do the colors or the sketch or both. I chose just the sketch for my card today. This is how I put the shaker together: I used the 5th and 6th die cuts in from the outside of the Oval Framelets Dies. I also used the 5th die to cut a piece of window sheet acetate and a Whisper White piece. I glued the Window Sheet oval to the Bermuda Bay ring. I used the edges of a Dimensionals sheet to form the frame that will keep the shaker bits corralled. Make sure there are no gaps in your frame. You will have shaker bits escaping. I took sequins from the Bermuda Bay Sequin Trim, punched circles from a Crumb Cake piece from March's Paper Pumpkin, and dyed beads from one of those packets that packages sometimes contain to keep it dry. I stamped the sentiment from the Birthday Blessings stamp set onto the white oval. I flipped the Window Sheet over and added the shaker bits, peeled off the Dimensionals backing and put the Whisper White oval on top of them. Wallah! That's it. I finished the card front by adding the Cucumber Crush flowered piece that was also from March's Paper Pumpkin. 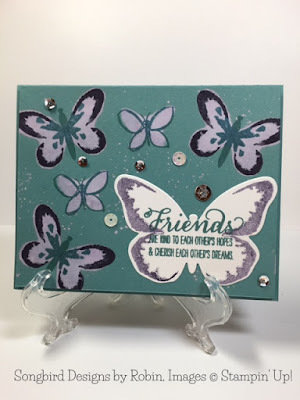 I stamped and punched 3 butterflies from the Papillion Potpourri stamp set. Finally, I made a bow out of the Cucumber Crush Dotted Lace Trim. Whew! This card took awhile to assemble, but I think it was worth it. What do you think? Please leave me a comment below and subscribe to my blog. All those strips at the bottoms had me scratching my head. Instead of finding papers or ribbons for them, I decided to ink strips instead. I used Lost Lagoon, Pool Party and Soft Sky for my strips. 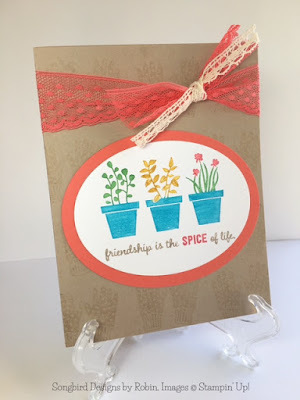 I repeated the Pool Party along with Sahara Sand when I stamped the flowers. For embellishments, I used some White Metallic Tape I had leftover from Sale-A-Bration and some Pool Party ribbon. The sentiment is from February's Paper Pumpkin. I embossed it in white. Everything is on a Pool Party Cardstock base. This card didn't come together easily, but I think it was worth the struggle. If you have this set, dig it out and show me what you come up with! I had great fun stamping with a good friend yesterday. There's something about stamping with others that makes me more creative. Is that the way it is with you? Since I'm not a Clean and Simple kind of gal, I was tempted to add much more to my card design. I really had to rein myself in. The focus of the card is on the top half for a reason, so I decided to leave the bottom blank. I cut the butterfly using one of the dies from the Bold Butterfly die set. I cut a duplicate one out of some leftover Botanical Gardens Designer Vellum Stack. The colored strip is a combination of colors I sprayed at random. The rhinestones showed the butterfly's flight path and fulfilled the bottom element of the sketch. 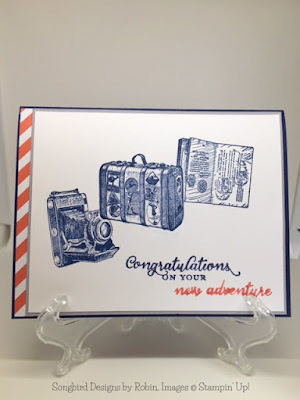 The sentiment is from the Happy Home stamp set and is embossed in white. Thanks for stopping by today! I love comments so please leave one below. 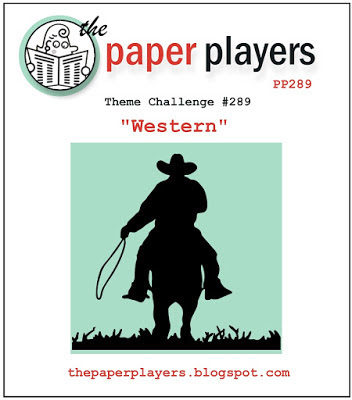 As soon as I saw that Laurie over at Paper Players had chosen a Western theme, I got so excited! I've been riding horses since I was three because my dad raised Quarter Horses. My dad HATES getting dressed up. He thinks a bright western shirt and his "good" jeans are just fine, no matter the occasion. So this card is for him. 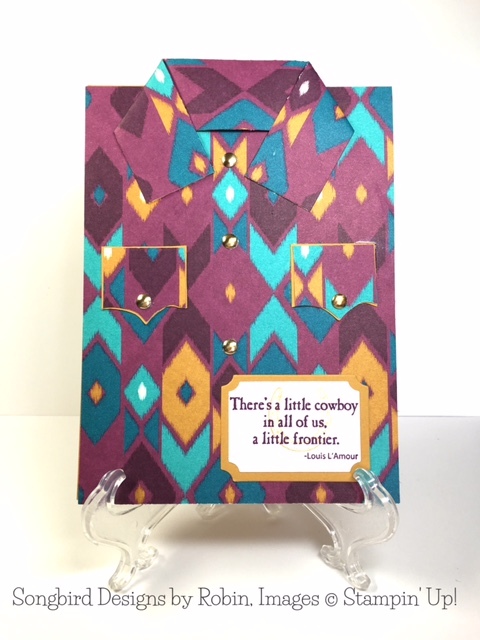 The sentiment is from the retired Horse Frontier stamp set. I kept it just because horse themed sets don't come around that often. I'm putting this sharp card aside for Dad's Father's Day card. He's a man of few words but it should produce a grin. Let me know what you think and please subscribe if you liked today's post! I have a special friend who is having a birthday. This special friend deserves a special card, and I think I have just the card to make her smile. 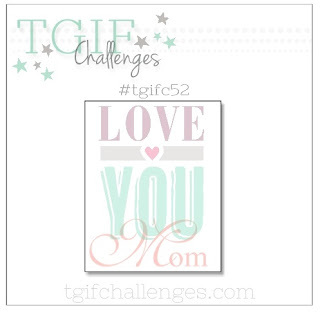 I used this week's Fab Friday challenge as my inspiration. And here's the challenge from Fab Friday. I just LOVE the way this card turned out! If colors could shout, these would shout Spring. They are so fresh and pretty! To make the main panel of my card, I sponged the three colors onto Whisper White cardstock. I made sure the entire piece of cardstock was covered with sponging. Next, I stamped flower images from the Flower Patch stamp set using VersaMark, then embossed them with white embossing powder. My sentiment and the border around it are from the Tin of Cards stamp set. I added some bling with Pool Party Glitter Ribbon. This ribbon is very easy to work with. I was pleasantly surprised. This awesome ribbon will disappear when the new Annual Catalog comes out June 1st, so don't forget to order some before then! If you liked today's card, please leave me a comment below. Better yet, subscribe to my blog and weekly newsletter!